Today, there is a need to know just how loud your surroundings really are. The CM-80 is an affordable IEC 651 TYPE 2 & ANSI S1.4 TYPE 2 SPL meter. The CHECK MATES are inexpensive tools that everybody working in loud environments should own. Windscreen and protective case are included with the CHECK MATE models. 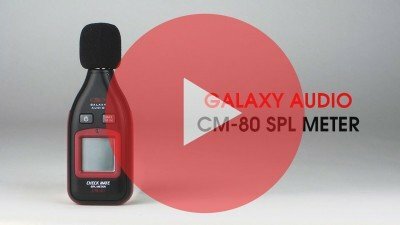 The CM-80 is the latest in the line of Galaxy Audio SPL Meters. The CM-80 measures sound presure levels in real time, has a MAX/MIN hold function, power save, and has an automatic light detection that will turn the blacklight on when environmental light is inadequate. The CM-80 comes with a windscreen. Over time, all SPL meters lose their calibration. The CM-C200 is an SPL meter calibrator. The CM-C200 meets IEC 60942 2003 Class 2 and ANSI S1.40-1984 standards. The CM-C200 can calibrate 1", 1/2" and 1/4" microphone capsules at 94dB and 114dB. The calibrator is designed to calibrate SPL Meters with a microphone diameter of 1/4", 1/2" and 1". The CM-C200 will work with any of the CheckMate SPL Meters and many other brands. 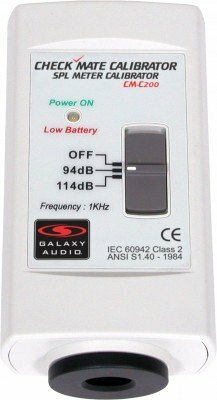 The CM-C200 has a test tone at 1kHz at both 94dB and 114dB. The CM-C200 includes 2 adaptors a protective zipper pouch and manual. 5.87" x 2.24" x 1"